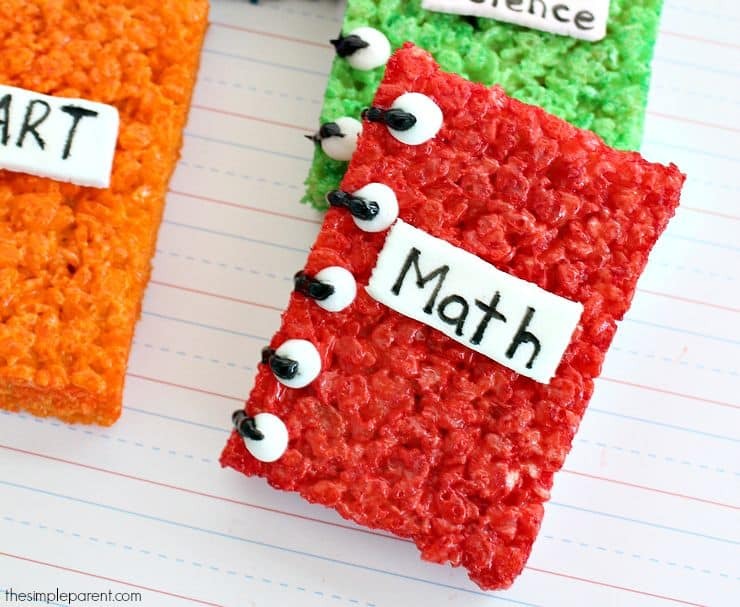 If you’re looking for a fun way to get the kids in the Back to School mood or to celebrate during the first week of school, these rice crispy treat ideas are a fun to make with the kids! You can also make them and surprise them when they get off the bus on the first day of school! Crispy rice treats are popular in our house. Everyone loves them, not just the kids! 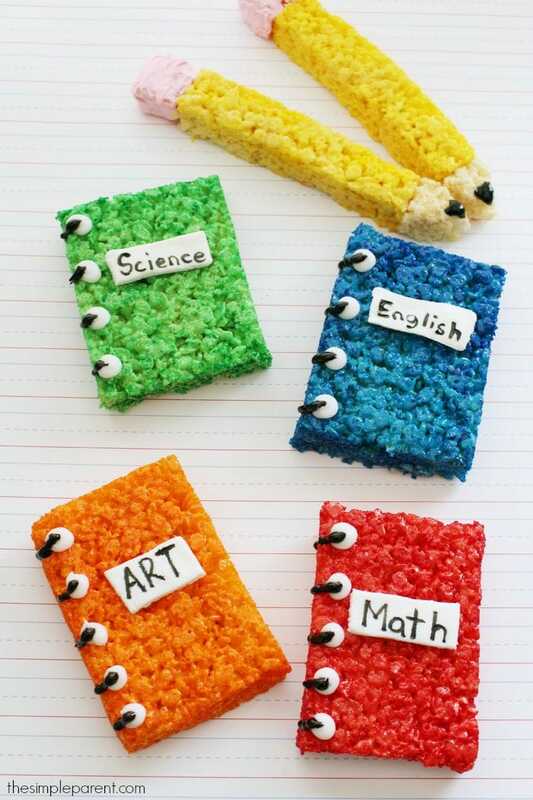 And to quote Weston, we’re actually on a mission to make the “best ever rice crispy treats!” So it’s fun to do a fun twist to make them special for the school year! I’ve provided some links to supplies you might need so there are some affiliate links in this post! This one has a longer ingredient list than I usually sign up for but it’s really an easy rice crispy treats recipe once you get going! Line a 9×12 pan with foil and spray with non-stick cooking spray. Set aside. Using a rubber spatula sprayed with non-stick cooking spray, transfer the cereal mix to the prepared pan and press down firmly and evenly. With a metal spatula, loosen the crispy rice treats from the pan. Invert them onto a plate. Using a sharp knife, cut 4 equal rectangular pieces for the notebooks. Make sure there are some left to make the pencils. Spray each rectangle with Wilton Color Mist. I used the colors red, blue, green and orange. Let set for 30 minutes. 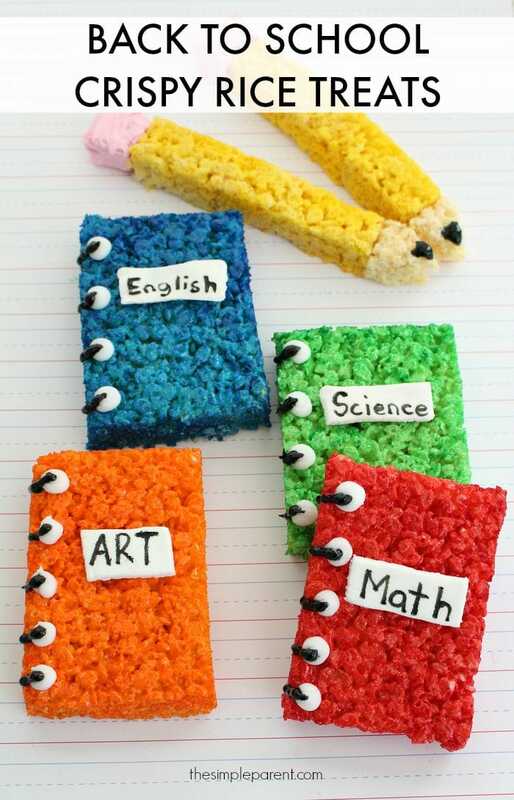 With the cookie frosting, pipe 4-5 round circles down the left side of each notebook to resemble the hole punches. Using the black gel icing tube, squeeze the icing onto each “hole punch” and go left towards the edge of each notebook to resemble the spirals. If you want to add labels to your notebooks, roll out fondant and cut 4 pieces that are about 1 1/2 inches long by 1/2 inch wide. Apply a small amount of the white decorator icing to the back of each fondant piece and press on to the upper middle of each notebook. 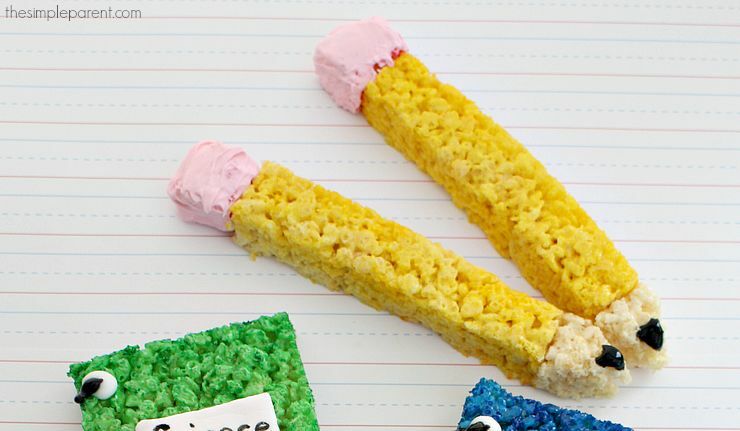 With the left over crispy rice cereal mixture, cut out two 5 inches long by 1/2 inch wide pieces for the pencils. Cut out 2 triangles (1/2 inch wide) to attach as pencil tips. Set aside. Cut out two 1″ x 1/2″ rectangle pieces to attach as erasers. Spray the 2 long pencil pieces with yellow Wilton Color Mist. Set aside. Microwave the pink chocolate melts for 30 seconds. Stir until completely melted. 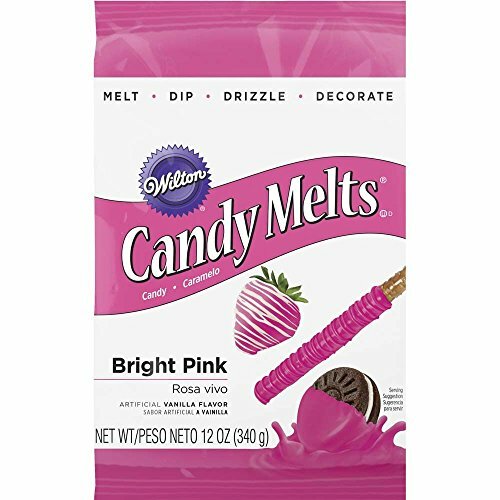 Dip the 2 eraser tops in the melted pink chocolate until completely covered. Let dry for 10 minutes on wax paper. Pipe a small amount of the decorator icing onto the pencil tip pieces and attach to each pencil. Once dried, pipe a small amount of the decorator icing onto each eraser piece and attach to each pencil. 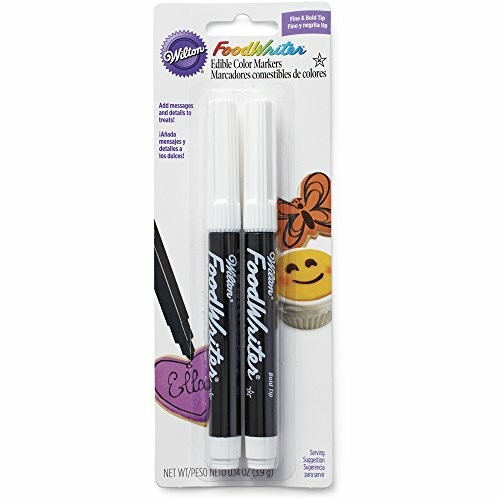 Apply a small amount of black icing gel to the tip of each pencil.